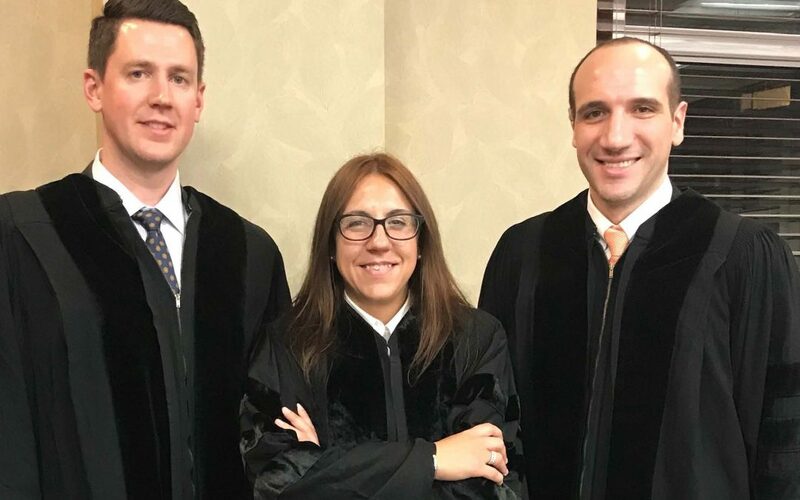 On April 4th, 2018, CMBG3 Law attorneys Kendra Bergeron, Nicholas Blei and Clifford Pascarella volunteered to judge law student oral arguments as part of the 2L Legal Writing Class at New England Law | Boston. The students’ oral arguments and written briefs were grounded in Fourth Amendment search and seizure issues incorporated in the hypothetical fact pattern assigned to their class by Adjunct Professor of Law Rebecca Moor. Kendra, Nick, and Cliff (all alumni of New England) were impressed by the overall preparedness of each student and their ability to respond to questions from “The Bench” in this mock oral argument experience. Kendra, Nick, and Cliff were all happy to volunteer in cooperation with Adjunct Professor of Law Rebecca Moor, and Professor of Law Gary Bishop, Head of the Legal Writing Department, as a way to give back to their law school and develop the legal minds of tomorrow. CMBG3 Law will continue to participate in opportunities like this to provide positive contributions to the community. If you would like to discuss our involvement with the community, please do not hesitate to contact John Gardella (617-936-4353 or email him).